You know, I have read that in the book the character of Briony Tallis (played by Saoirse Ronan and Romola Garai in the film) is quite central, but that the character has a much diminished role in the movie. Well, the character’s role in the marketing campaign will apparently be diminished to the point of near disappearance. 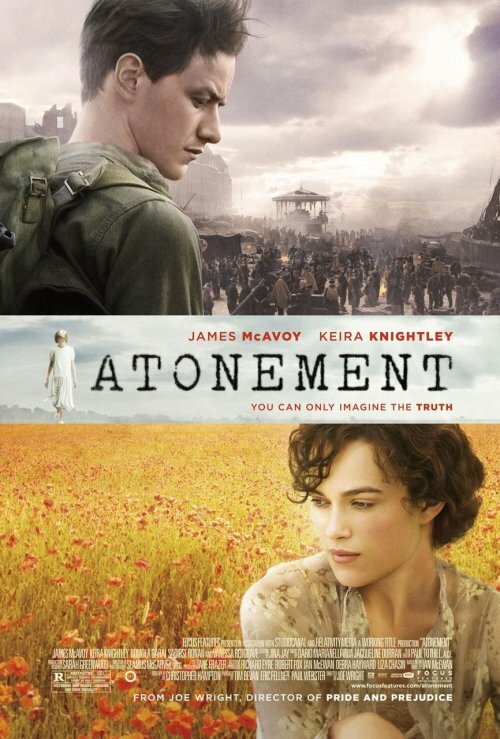 The poster is all about the two lovers, played by Keira Knightley and James McAvoy. And that is probably the right choice, from a marketing standpoint. And I think the poster does a good job of illustrating the tension at the center of the film. The characters are separated, apparently hopelessly so. But the expressions and the way their faces are pointed makes us believe that they are still thinking about each other, still joined in an emotional sense. And the poster doesn’t look bad either. So a good job all around. I wrote about this poster on my blog. Don’t you think, somehow, James McAvoy looks like a 12-year-old anime character? I read that, and then I went looking for yu-gi-oh images. And now, after this careful research, I can say that I see what you are saying. It’s interesting that the previous poster uses almost exactly the same image of McAvoy, but in that he has a bit of a beard and more marks in his face. I imagine the new image received some heavy photoshopping. Have you seen the new character posters? They look great, and surprisingly edgy for this kind of film.